Get ready for Christmas with a virtual Christmas tree show! See our colorful farmhouse Christmas tree and check out the rest of the beautiful Christmas trees that are shared. 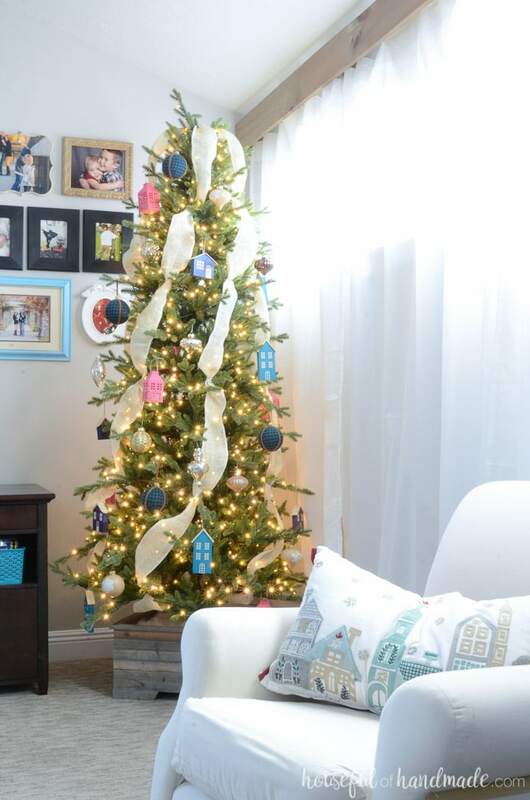 I am so excited to be participating in the My Home Style Christmas Tree Blog Hop this year. The wonderful Stephanie from Casa Watkins Living puts together this fun hop to share lots of different home styles with you. I love the inspiration that I have seen already. And, of course, all the Christmas trees! First I want to welcome all the readers coming along the hop from DIY Decor Mom and all the other wonderful blogs. 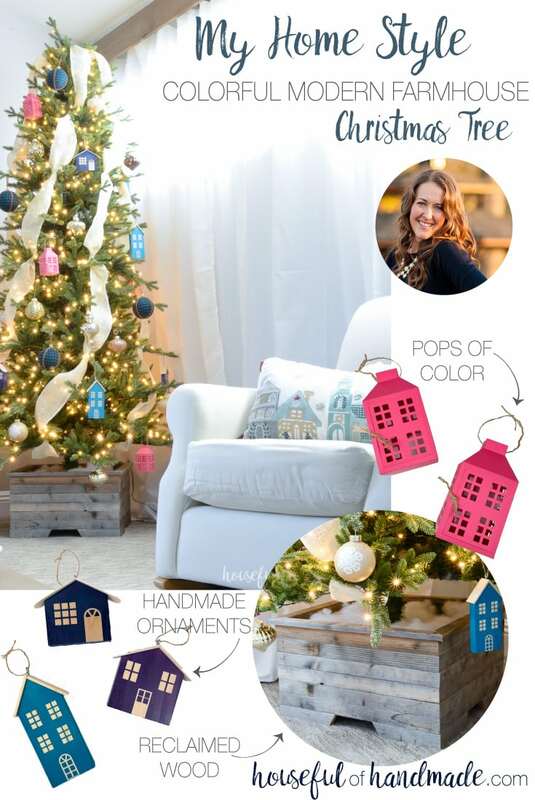 I’m Kati and I love to share fun DIYs to help create your dream home on a budget. 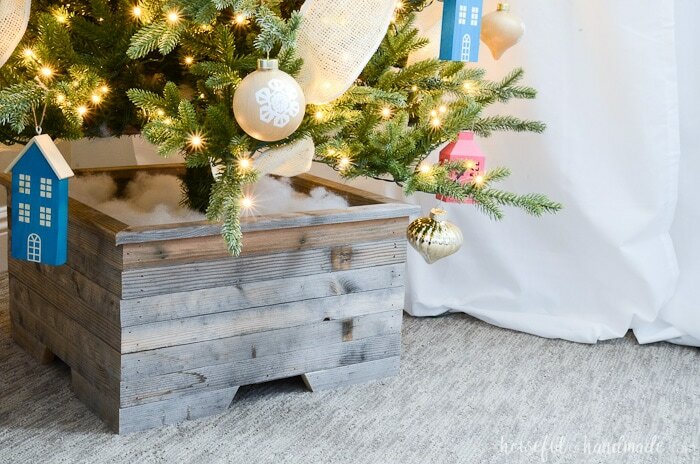 After you check out our Christmas tree, you will want to continue the party by visiting DIY Beautify and she will let you know where to go from there! To start off the hop, I was asked to define my home style in 3 words. Yikes! That was a lot harder than I thought. Maybe I don’t like to be put in a box. Maybe I love so many elements from different styles. Maybe I should look into a new design style called “Kati”! (JK, that would be conceited). But after a week of intense thinking and calling my mom and sister for help, we defined my home as Modern Colorful Farmhouse. 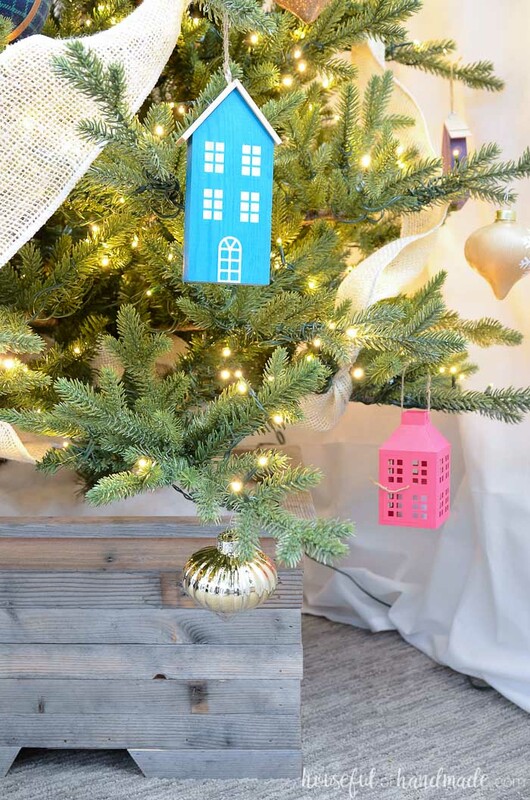 This year our Christmas tree definitely fits into the modern, colorful farmhouse Christmas tree theme. It has reclaimed wood, handmade elements, neutrals, and of course a pop of color. And because I like to keep things simple in my decor (because everyone knows my life is far from simple! ), I kept my tree nice and simple this year too. But before we can talk about the decorations, I want to mention our new Christmas tree. Last year after taking down our faux tree I gave it away because I keep meaning to get a new one that fits the space better. Unfortunately we kept getting busy and the old tree would just go back up. So in order to force myself to finally get the perfect tree for our home, I got rid of the old one. As soon as Halloween was over I started shopping for our new Christmas tree. Our living room is long and skinny. It is a decent sized room, but horrible for decorating because it’s so narrow. And a full sized Christmas tree would just encroach into the space way too much. I insisted on a new slim tree, with sparse branches that mimicked a real tree. I would definitely love to have a real tree, but sometimes you have to choose something to give up when you are busy, and a fake, pre-lit Christmas tree just makes my life easier, so we go with it. Once we got the new tree in the space, I also realized I did not want to put a tree skirt on our tree either. I do love a beautiful, ruffly, tree skirt. But my kids just mess it up and I spend so much time smoothing that thing back out. I knew my Roomba vacuum would probably try to eat it too. So instead I made a tree box out of reclaimed wood. Then we added the tree and covered the stand with stuffing to look like snow. I love it even more than my tree skirt! For the tree, I added some white burlap ribbon that I already had. However, this year I decided to go vertical instead of horizontally around the tree like I normally do. To keep the ribbon in place, I used twisty ties (the kind that come with non-zip baggies) and gathered the ribbon then twisted it around a branch. Easy peasy! This year for ornaments I had a million DIY ideas, but life is busy this time of year so I managed to get 2 ornaments made for our tree (maybe that is why people do this in July). Then filled it in with some beautiful vintage inspired glass ornaments in the perfect Christmas neutrals of gold and silver. 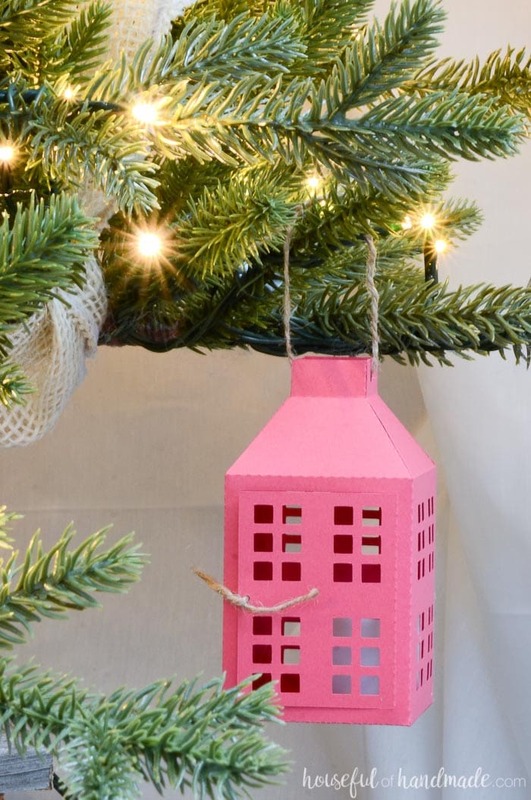 These little paper lanterns are my favorite ornament this year. I was inspired by some large gold lanterns in the Hearth & Hand line at Target. The shape of the lantern was so simple, but so detailed. I ran home and created a little knock-off to hang on my tree, but instead of gold I added that pop of color that I love by using magenta cardstock. I will be sharing the DIY tutorial for the ornaments next week so make sure to stop back by. Our other DIY ornament came about as I was avoiding my ever growing to-do list and playing around in my wood shop instead. My garage is brimming with scraps of wood that I am scared to toss. You never know when you might need 6″ of this or 4″ of that. So I grabbed a handful of 1×4 scraps and cut them into little house shapes. Then I painted them with some bold colors, but making sure to leave some of the natural wood showing. 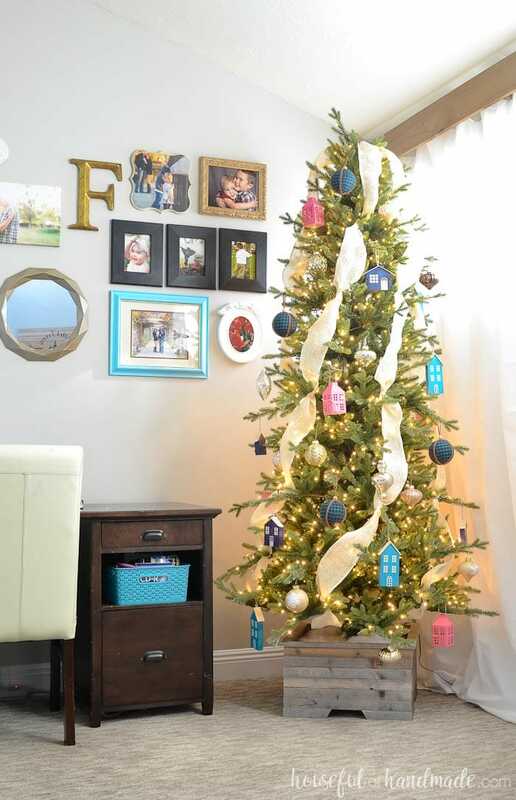 I truly love the simplicity of our modern, colorful farmhouse Christmas tree. And with the lights, our entire home feels just like Christmas. Now we need to fill it up with our gifts, time to start wrapping! Don’t forget to keep the party going. 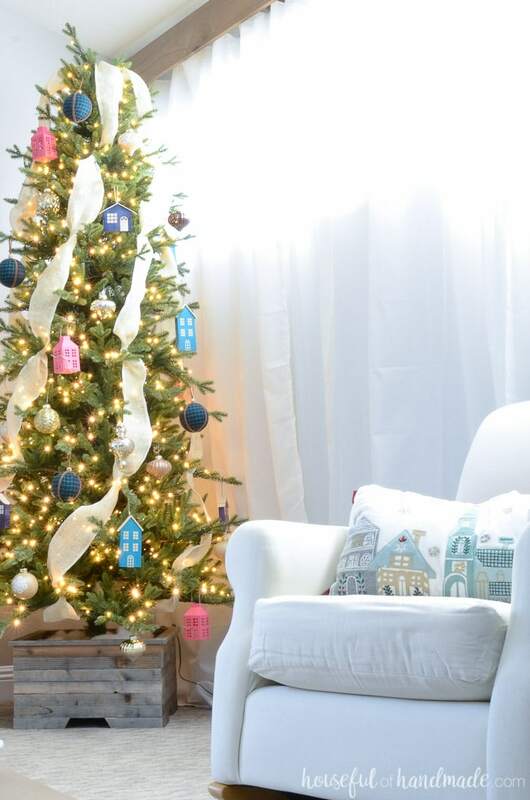 Refresh that cup of coffee and then hop on over to DIY Beautify to see more Christmas tree inspiration! You know that I love pops of colour, so you must know that I totally dig your ittle tree situation. Well cone my friend! Happy holidays! Thanks Ariel! I love that we went colorful. Happy Holidays! Thank you Heather! Merry Christmas to you too. How gorgeous! I love those colorful little houses. Your tree is so super pretty and the tree collar is such as great add Kati. Thanks so much Stephanie! I love the fun colors this year. Those colorful house ornaments are fantastic! Beautiful job! I am so happy I finally went for a smaller one. I feel like it fits the space so much better. Now I am not eager to take it down after Christmas. Ooooo…such a pretty tree. I love how you placed tge ribbon going vertical! Merry Christmas, Kati! Thanks Julie! It was fun to try something new. Thank you. I love being able to use up all those scraps. 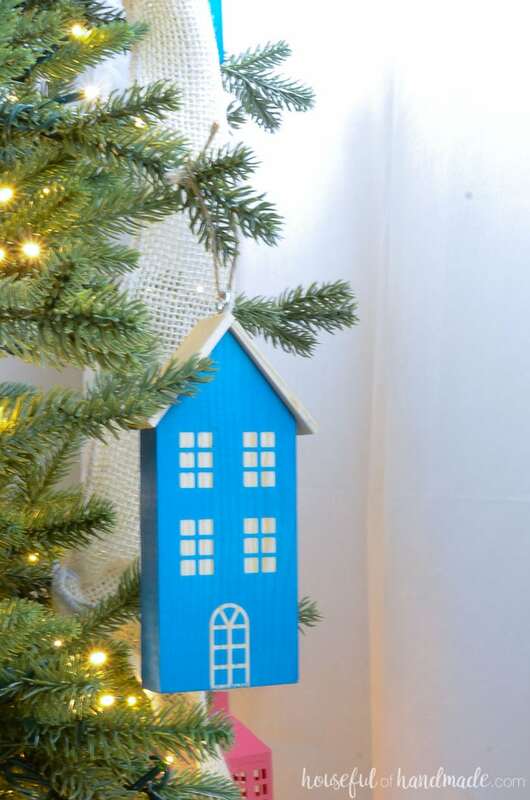 Oh goodness, the little wooden house ornaments are adorable! I love them! 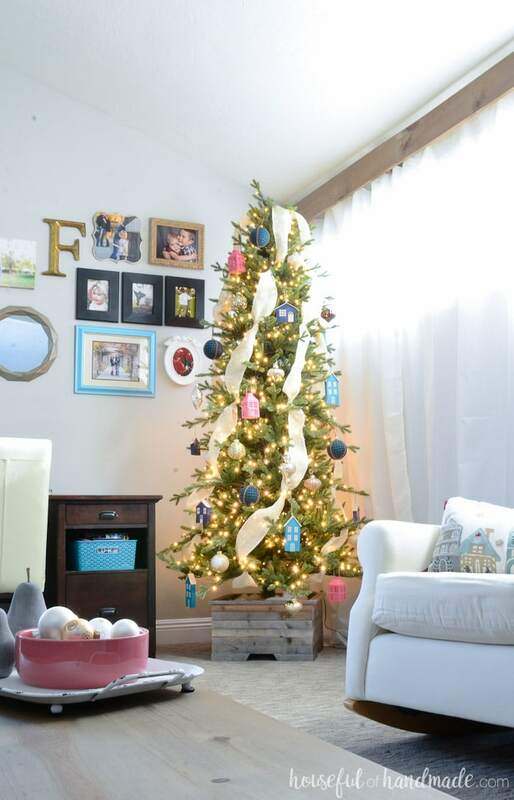 Kati, I am loving the fun pops of color on your tree! It’s so festive! I love the color scheme of your tree!! Looks beautiful!